Much has been written about the simplicity of converting a TR6 to a GM alternator and I can now tell you that it simply isn't true..... at least for model year's 75 & 76 which have an Air Pump sharing the Alternator mounting bracket. My Air Pump died a few years ago so it's been removed, eliminating that mounting problem. 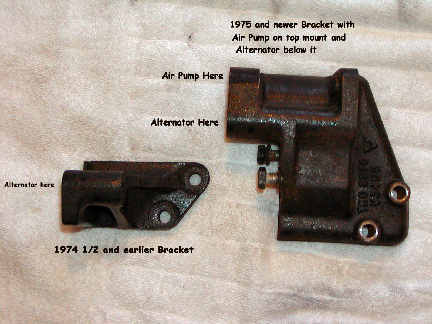 The only way I found to get a GM alternator mounted on my 75 TR6 was to order a bracket for a 74 1/2 or older unit. I was lucky that VB had one in stock as Moss shows them as no longer available. If anyone has figured out how to use the stock bracket for a 75/76 TR6 I'd love to see how they did it. Click on any picture for a full size picture. All the full sized pictures are about 75 - 100K in size. Even with this bracket, it took a small amount of grinding and cutting on the engine block to get everything to fit. Once complete, I was even able to use the stock TR6 fan belt eliminating the hassle of having to jack my engine up to gain clearance from the steering rack. 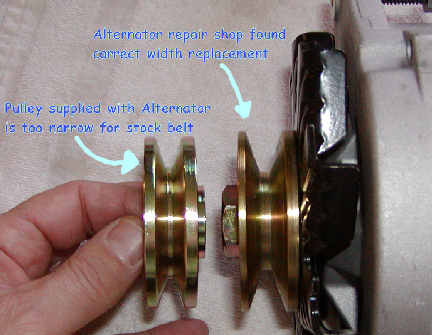 I found that remanufactured GM alternator prices from the chain auto parts stores ranged from about $25 to $100. I settled on Auto Zone's Duralast for $55. Once you have one, the first thing you'll notice is that the pulley is too narrow for the stock TR6 fan belt. I had to bring the Lucas and the GM unit to an alternator repair shop to get the correct pulley installed. He used the Lucas pulley as a reference as it will not fit the GM unit. While there he also gave me his opinion on all the remanufactured units, be it labeled Delco-Remy or Duralast.... basically junk, so go with the best warranty from a reputable auto parts store. Auto Zone did not recommend their bottom of the line unit as they replace defective parts but don't test the units after. According to them, their Duralast line at least gets tested.